Welcome to the latest Railwaymedia blog after an absence of almost two months. I had intended to write one before I went on holiday but various things conspired together to mean I never got round to it, so this time will have to be a longer than normal edition to catch up. 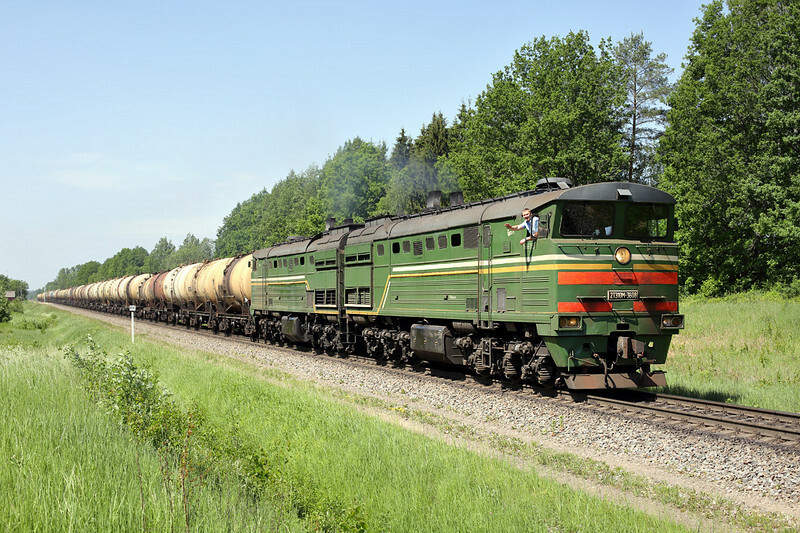 My main holiday for this year was a week long trip to Latvia and﻿ Lithuania to see their large double engined freight locos. 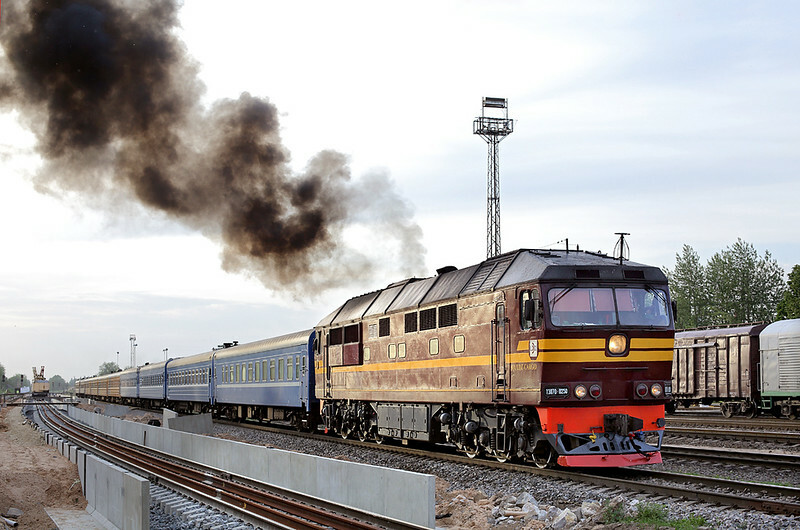 There is little passenger traffic in both countries outside the main commuter areas surrounding their respective Capital Cities and beyond these areas all lines are diesel hauled and mainly single track, although as they are so busy some lines are being upgraded. Before I went there though I had a mini trip to Lincolnshire which was one of the reasons I didn't find the time to write a blog earlier. Thanks to Richard for driving, the two day trip covered firstly Derbyshire and the area around Stenson Junction before staying overnight in Market Rasen and then the following day doing the wider Barnetby area. Both of these I have covered myself before but as I normally travel by train the car helped me get to some locations I normally can't reach. Starting in Burton-on-Trent, somewhere easy for me to reach by train, we had an hour or so on the footbridge near the Coors Bewery in the town. 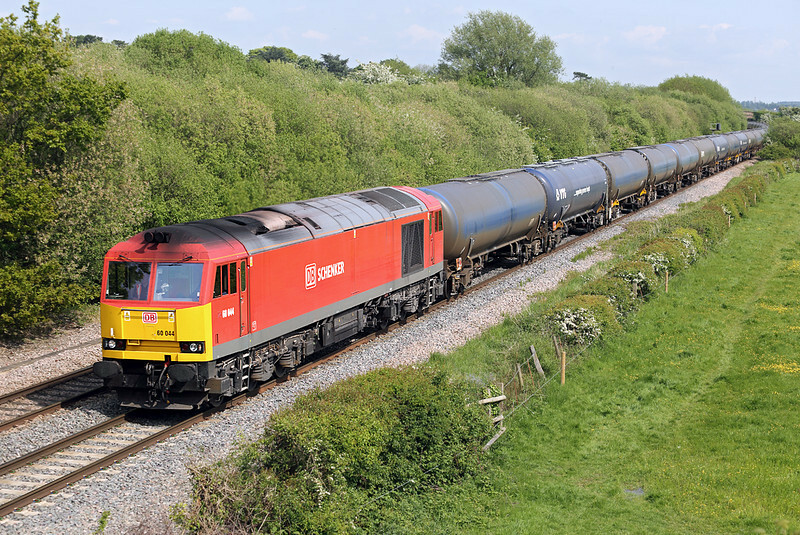 The Derby to Birmingham line is one of the busiest in the country for freight with usually one or two per hour to be seen. If you can get hold of a copy, Marcus Dawson's Trainspots Midlands book is still very useful for reaching the locations in the area, though I know it is now out of stock at the publishers. 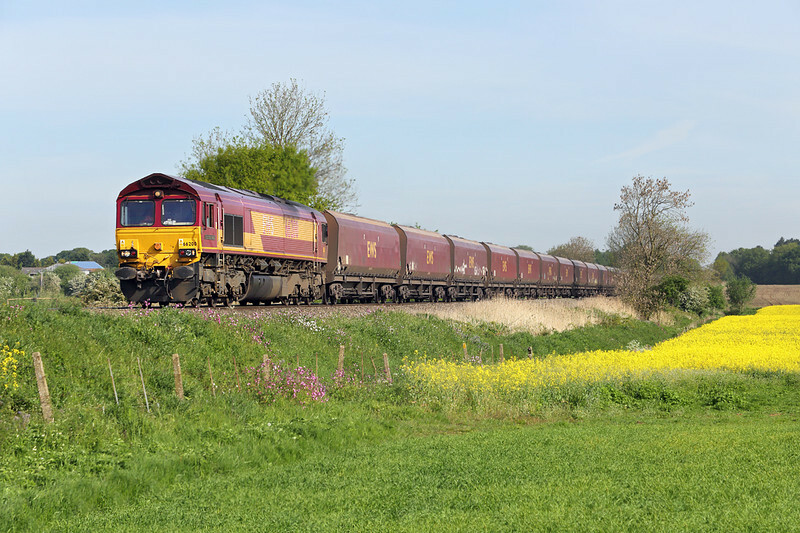 One of the few locations I had not done previously in that region was at Barrow-on-Trent (above) on the freight only line that bypasses Derby. Paces like Stenson and North Stafford Junctions I have walked to in the past from Willington station but Barrow was a bit too far, although there is a bus service from Derby to Sinfin operated by Arriva from where it is about a 20 minute walk. We needed to reach Market Rasen by evening. We had intended to wait at Barrow for the Colas steel train to Boston Docks but with no sign of it leaving Washwood Heath we headed east whilst I kept an eye on it on Real Time Trains. It departed around 60 minutes late so we stopped off at Ancaster in Lincolnshire to get a picture of it. The sun isn't right anywhere really for this working but with a nice evening low sun glinting off the train it being back lit wasn't too much of a problem. We had got a cheap deal for the night at The Limes Hotel 5 minutes walk from Market Rasen town centre and finished the day with a rather nice curry at the towns sole Indian restaurant washed down by the obligatory few pints in the pub over the road. A very quiet but pretty town, the station was worth a visit too but unfortunately there wasn't time for any pictures there. We rushed breakfast in the morning in order to get out for shots of two freight trains that were due to pass just before 0900. We hadn't researched anywhere to go for them so a quick look at Google Maps revealed a Level Crossing that looked reasonable. The crossing itself wasn't fantastic but the adjacent field served our purpose, especially for the westbound coal. We picked a bad day to go to the Barnetby area as the Iron Ore trains weren't running. Maybe the plant at Scunthorpe was having a week long closure because there were many fewer coal trains than normal too. On the line between Barnetby and Scunthorpe we did do two new locations, both at the ends of very long tracks from the road making them very hard to reach without a car. One was at Elsham and the other at Worlaby. The first one isn't actually the main road crossing where the signal box is but is the next small farm crossing to the north-west; the track from Worlaby should be fairly obvious on a map. Not withstanding the paucity of freight trains, some midday cloud was also rolling in by this point so we retreated to the tried and tested location at Melton Ross. The other new location for me was Howsham on the Market Rasen line south of Barnetby. Out of the three lines radiating from the junctions at Wrawby I think this line towards Lincoln is my favoutrite. There are less trains than that towards Scunthorpe but there is a better mix of train types with more class 60 hauled tank trains heading this way. Again we were unlucky with clouds for the most part but we did scrape a nice late shot at the bridge where the A1084 crosses the line. 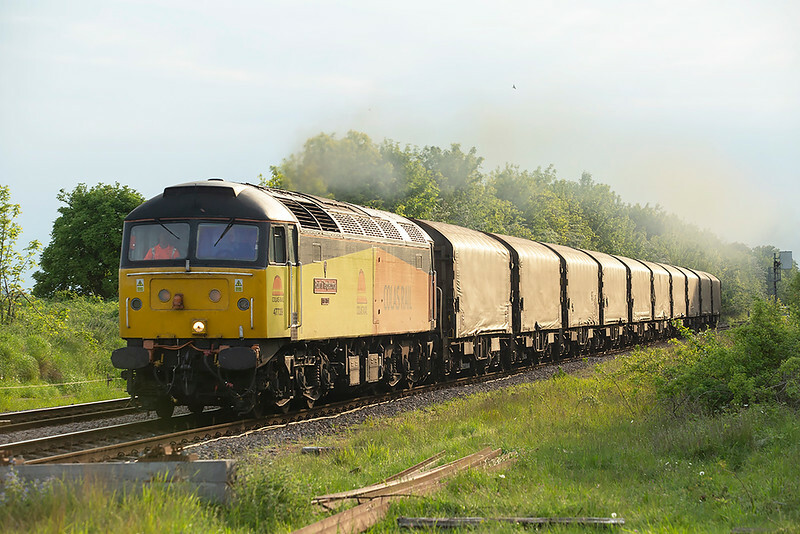 The end of the day was planned to be, for the second day running, a shot of a class 47 on a freight train. 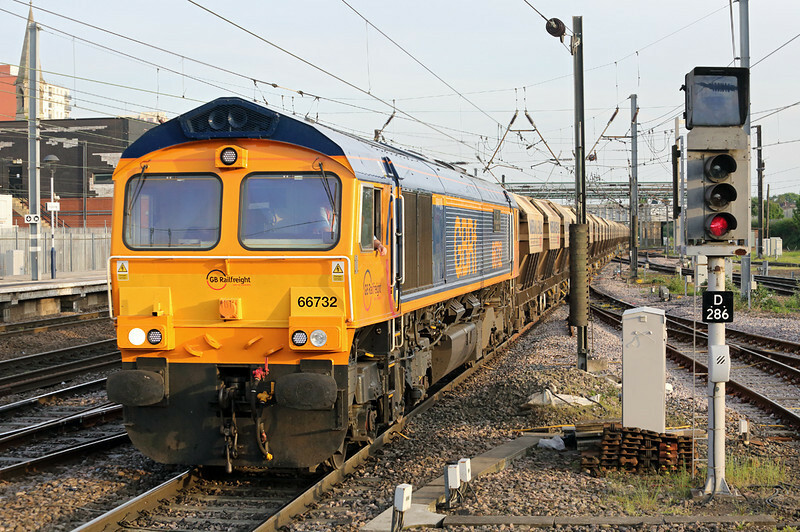 GBRF have been hiring one to operate a service between Doncaster and Goole to release the normal class 66 power for use elsewhere. Richard went to the Thorne area for it whilst I had to make do with Doncaster station as I had to get my train home. The sun was out so it should have been a good shot except for the fact the 66 stayed on the train and it came on the wrong line! Anyway, moving on to the main bit of this blog (and skipping a few outings mainly for bus pictures). The week to the Baltics was always going to be a car based photographic holiday due to the difficulties of getting around the coutries (and especially between the countries) by train. I had sorted the car hire out last year for Bulgaria so I let Richard take responsibility this time; besides he would be at Riga Airport before me. We ended up with an Estonian registered small Skoda which did the job and, hopefully, all the locals assumed we were from Estonia. A comparably nice flight time from Manchester with O'Leary-air meant I didn't need to leave Preston until 0700. Previous trips have involved flights from Gatwick, Luton or Stansted so an hour (stood up on the usual full three car class 185) to Manchester Airport was comparatively relaxing. I'll give Ryanair their due I've never as yet been late on a plane they've operated but it's everyhting else about flying with them that you end up worrying about. This time it was the new rule that only the first 90 passengers are guaranteed to take their hand luggage onto the plane. Having a soft rucksack containing all my camera equipment I really didn't relish the thought of it getting thrown into the hold. As it turned out I needn't have worried as they only confiscate the popular annoying square wheely cases, so bit of karma for all those times people have tripped me up with them. The new rule does have the advantage that there's now loads of room in the overhead lockers providing you are lucky enough to be able to get past the bag police and get yours onto the aircraft. With the two hour time difference between the UK and Latvia a 1030 flight became a 1500 arrival so I just had the rest of the afternoon photographing the trams in the city. A bus/tram/trolleybus ticket for the whole city coast a massive 2.50 Euro so I took advantage by hopping off the Airport bus when I saw a busy tramline skirting some parkland. 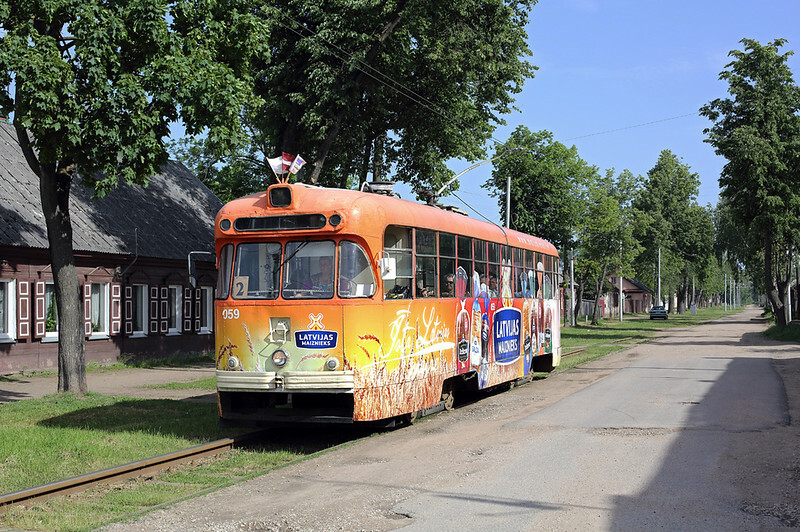 Riga is Tatra Tram heaven, certainly on the west side of the River Daugava, modern Skoda trams are in use only on lines 6 and 11. They even have converted examples like above for keeping the rails cool and the dust down. The first day is always a bit of pot luck as you find your feet in a place. Once I had sussed out where the trams went in the City Centre I visited the station. There wasn't an awful lot happening and just got one picture of an EMU waiting departure before finishing taking tram and bus pictures until it was time to head out to the hotel to meet the others. Our first night was booked in the Hotel Best in the south-western suburbs. As we were leaving by car in the morning this wasn't a problem besides there's something nice about having to catch a trolleybus or tram into the City in the evening. We ate at the hotel, nice food though maybe not cheap for Latvia. We found a good pub in the centre, Alus Seta which is owned by the Latvian brewing company Lido. Their unfiltered beer was superb. We went back the following Saturday but it wasn't on, which was a disappointment. We could've eat here too as they do a sort of buffet/canteen food service in addition to the bar. We had planned to spend the Sunday slowly making our way across to Lithuania and our base in Vilnius for the next two nights. Looking at the map we decided to head south down the A7 from Riga first of all to Iecava which is on the cross-country freight line from Jelgava to Krustpils. We of course had no idea if it would be busy or not on a Sunday morning but it turned out to only be about 20 minutes before the first train turned up. We had an hour to hang around follwing that but then got two within 10 minutes. The great advantage of single track lines in these coutries is that providing you can see a signal it can give you a good idea of which way the next train will be coming as, when the route is set for a train coming the opposite way, the light goes out. In the case of the train above we actually saw it arrive in the loops behind and wait for a westbound working to pass. 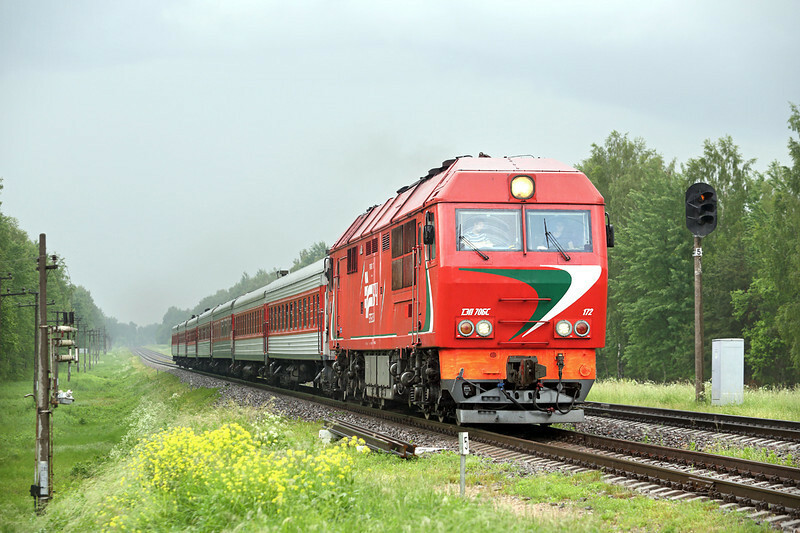 With plenty of time later in the week to concentrate on Latvia we crossed the border into Lithuania with the minimum of fuss (I think officer in the sole police car at the crossing was asleep) and headed to Radviliskies where there are large freight yards. We were going to call in at the station but with the expected passing of one of the three or four daily Vilnius to Klaipeda expresses we went instead to the crossing at the eastern end of the yards by Karcemos. Obviously a lot of these place names are lifted from Google Maps rather than the fairly spartan road map we had but hopefully Googling the place names I give should reveal easily our exact locations should you want to find them. Our first Lithuanian 2M62-hauled freight train arrived 2 minutes after we did and the passenger was right behind that (though I made a bit of a mess of taking that shot). 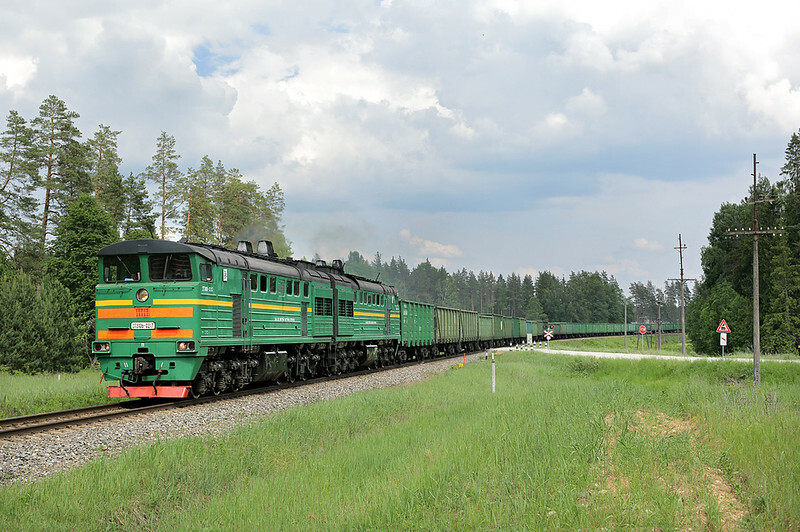 After a few more freights and light engines passed all hauled by the new Siemens ER20 class, rather than head back to Radviliskies we continued east to a small crossing near Bebrujai, the first after the lines towards Vilnius and Latvia split. The light was getting a bit ropey by now but a shot of an eastbound passenger from Klaipeda came out OK. All loco-hauled passenger trains in both countries are now in the hands of TEP70 diesel engines which look massive next to the usually smaller height coaches. Continuing east and more or less following the railway line we stopped off once more before deciding due to the weather, and time, to get much nearer Vilnius before a final stop. 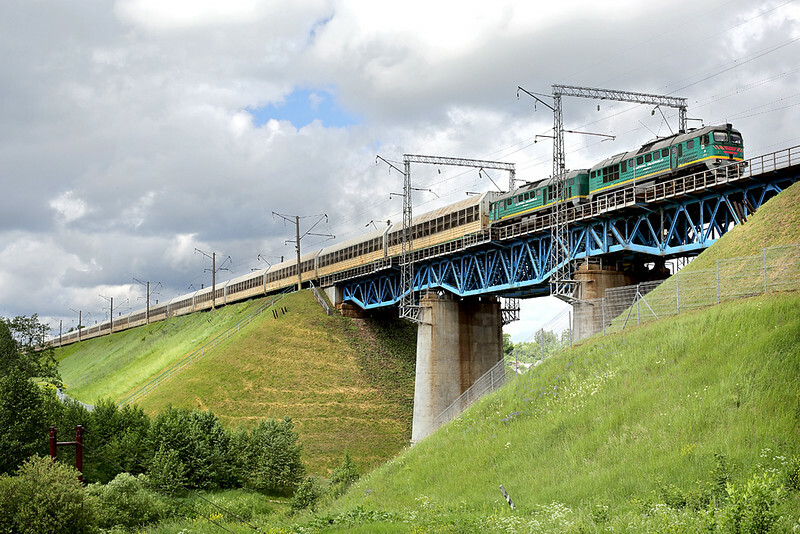 Zasliai is on the only electrified line in Lithuania that runs between the two major cities of Vilnius and Kaunas (the former Capital). In both countries electric trains comprise only of EMUs. Unlike Latvia where they are still using RVR design units Lithuania have modernised most of their fleet. 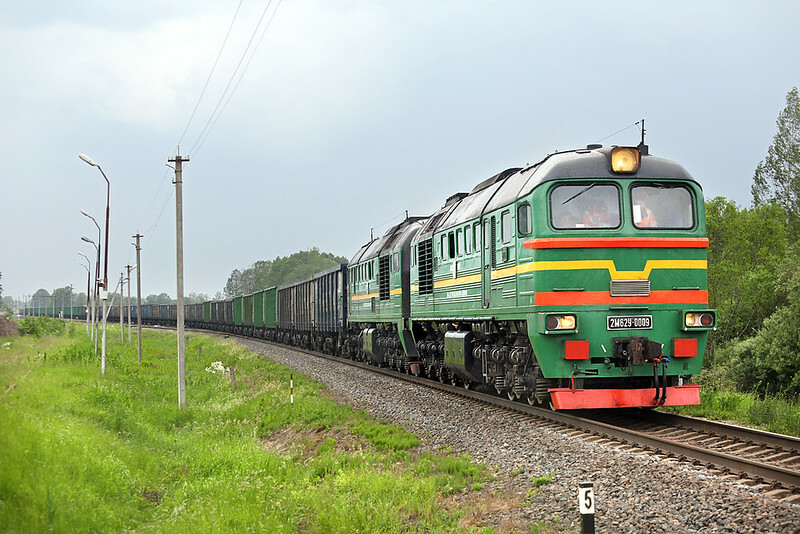 With this line forming part of the major freight artery between the Russian enclave at Kalingrad and the Motherland there was lots of freight to be seen even on a Sunday though rain stopped play for us in the end. The Corner Hotel in Vilnius was our chosen bed for Sunday and Monday night. A small walk from the centre but it did the job. It was I think the most expensive of all the hotels we stayed in that week at about 50 Euro a night. Tea both nights ended up being Pizza, the standard fall back option for most countries in Eurpoe, especially when you don't have the foggiest idea about the language. Having said that with the exception of a few older people in some of the out-of-the-way villages we ended up in most people spoke excellent English. We also found a good bar, Alynas, on Jogailos gatve serving 20 Lithuanian beers. The barman wasn't the freindliest but the beer made up for it. 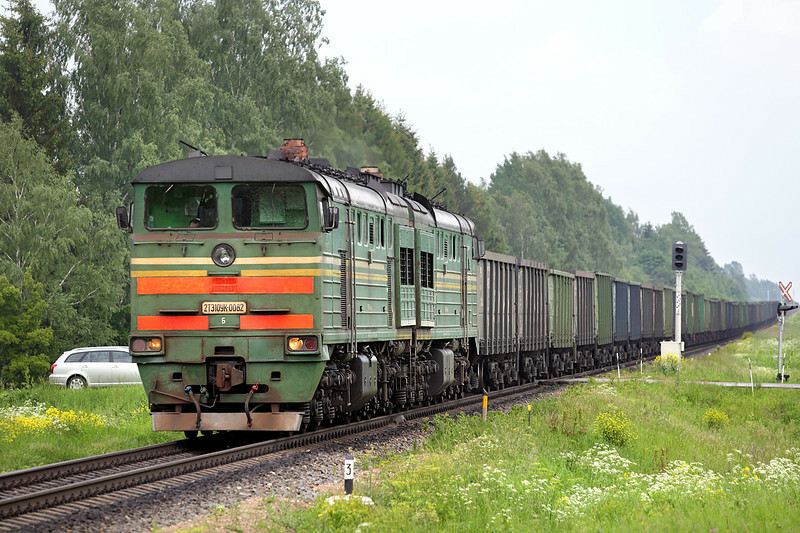 Freight usually bypasses Vilnius itself, the main yards are located to the south of the city and there is a freight avoiding line running right around the bottom of the suburbs. As with most of the rest of the area this was single track but, quite understandably, they are in the process of doubling it. We drove down to Siaudine where the freight line meets up with the line running due south towards Salcininkai. We had no idea what, if anything, went due south but we soon realised that the avoiding line wasn't currently being used at all. We discovered why as further to the east when we crossed the line we could see it was completely dug up whilst the track laying was taking place. 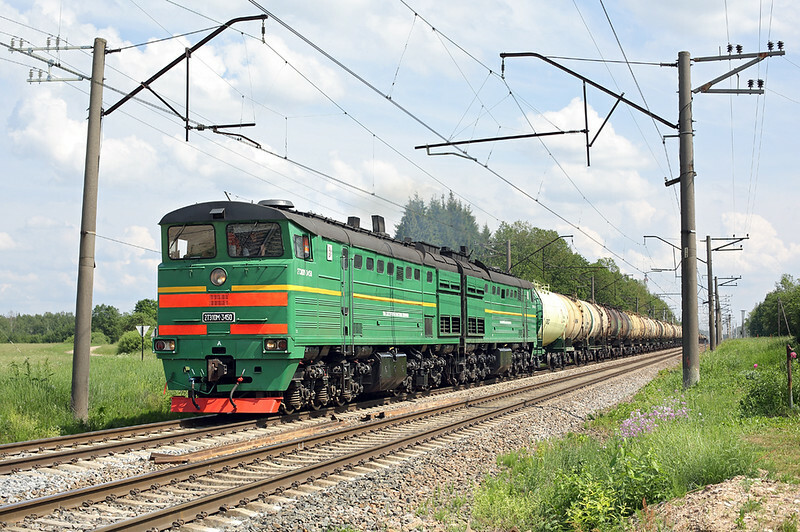 What appears to be happening therefore at the moment is that freight from Kalingrad and the west is running as normal into the freight yard to the south of Vilnius. 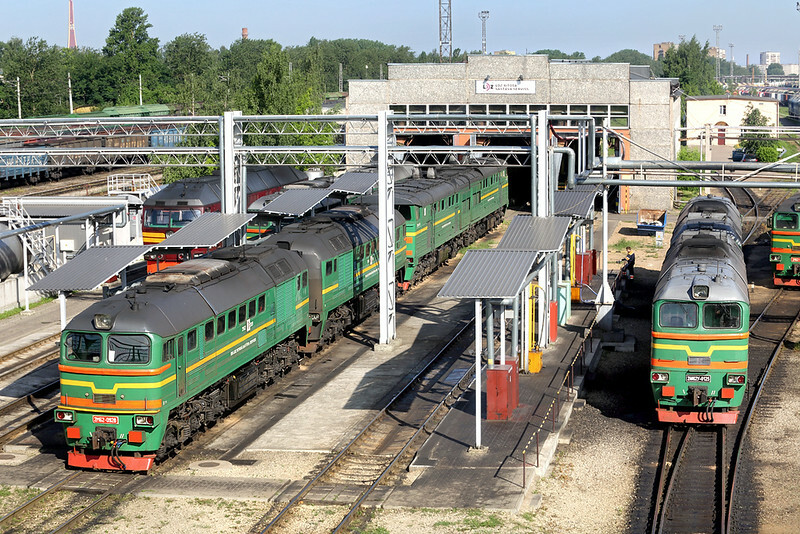 Engines are then being put on the back end and the trains are being dragged out west then back through Vilnius main station in order to reach the mainline to the south-east and Belarus. 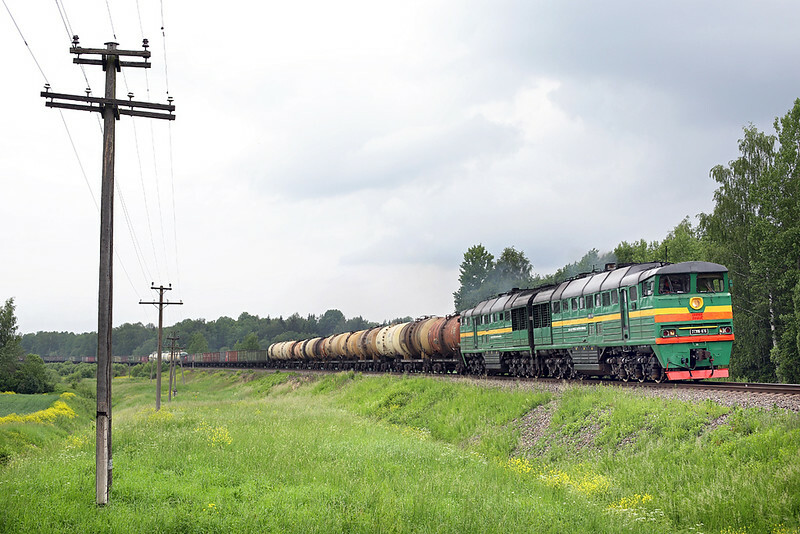 This also explains why we saw so many ER20's on the line to Radviskilies as they are being used for the main trunk haul with just a handful of 2M62s shuttling the freights between the yard at Vilnius and the Belarus border. 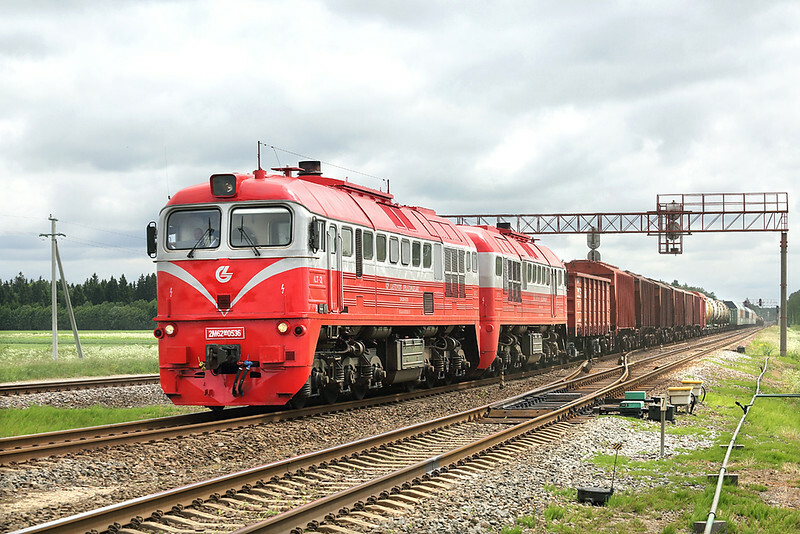 We spent the day at two locations on the Vilnius to Belarus mainline, Saduniskes and Pakene. They are a short distance apart; Pakene is a small station and has a basic four or five train a day DMU service from Vilnius so is easily reachable by public transport. With the weather generally dull this helped us as it meant we could photograph either way and we were fortunately at Pakene when the heavens opened so we could keep dry in the small station waiting shelter. The station before Pakene, Kyviskes, we understood to be a good location as it is at the junction between the freight only line and the mainline. We drove down to it but didn't stop as the formely rundown halt is being transformed with new tracks and new platforms in conjunction with the line enhancement so has been totally ruined, for now at least, for photography. By contrast Pakene was a good spot to wait. With trains running relatively slowly there was usually plenty of time to get to the correct end of the right platform before they arrived. 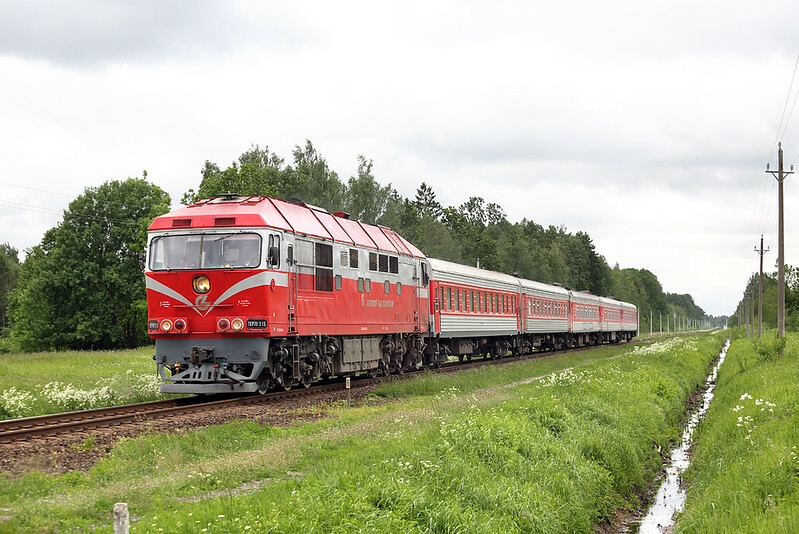 One of the highlights of this line is the Belarus TEP70s that power International trains. Unfortunately though the shorter distance cross-border Vilnius to Minsk services have gone over now to plastic units. I always think it is a bit of a cheat getting photos of trains from a country without actually visiting, especially as we were so close to Belarus, however the coutry is very much like Russia from a security point of view and you require a costly and complicated Visa just to enter so I will stick with just having photographs of their trains operating in Lithuania nd Latvia for now! After our second night in the corner of the Corner Hotel we had an hour or so sightseeing in Vilnius. I must be getting old wanting to do this. Alas there are no trams in the City but there are trolleybuses. 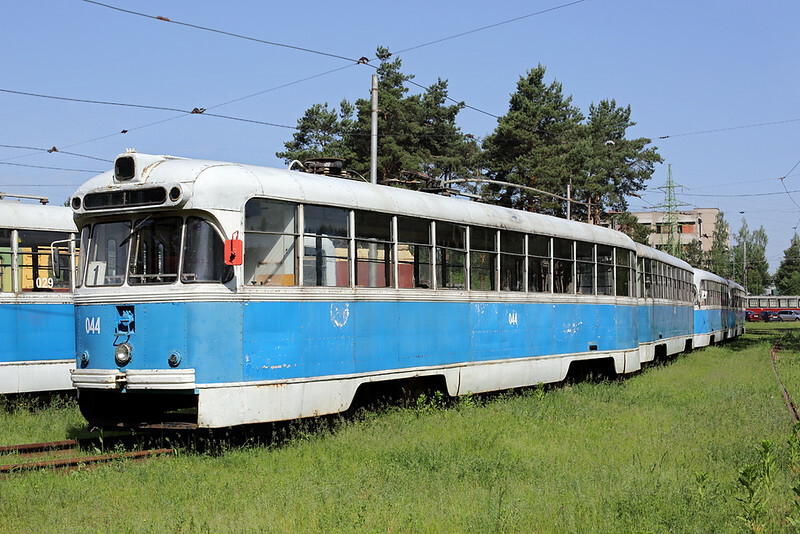 Anyone interested in the vehicular conveyances of Vilnius can see the pics HERE. Before we left Lithuania for good and headed north back to Latvia we had an hour on the Kaunas mainline west of the City where the line crosses the River Voke. A morning location we unluckily just missed a TEP70 that crossed the viaduct in the sun as we arrived and needless to say after that the only trains that crossed whilst it wasn't cloudy were units. We drove and parked on the west side of the river where a small suspension bridge leads to the spot however continuing up the footpath brings you to Voke station itself which has a roughly hourly stopping service. We bit the bullet after that and did the longish drive north to Daugavpils. We did really well until we neared the border, between Utena and Zarasai, on the A6. Admittedly this is a major trunk route with lots of International lorries so needs maintaining and upgrading but the roadworks were something else! Mile after mile of traffic light controlled contra-flows where you could wait 10 minutes at each one! It must've been an EU grant to just Lithuania because they stopped literally at the border, not that the road surface was in a much better condition any after changing countries. We skirted Daugavpils and headed east along the line from there to, again, the Belarus border. 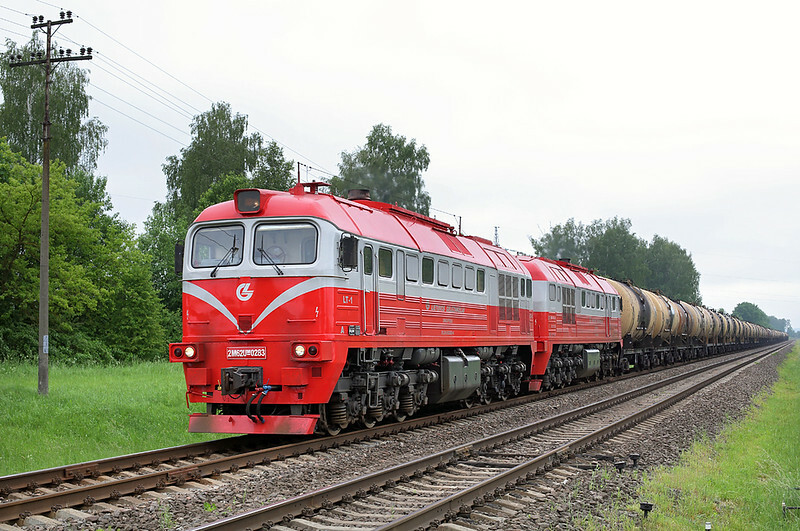 Unlike the line south from Vilnius where loco changes occur almost at the border, on this line the swaps occur at Daugavpils yards themselves so the line is worked purely by Belarus 2TE10s. 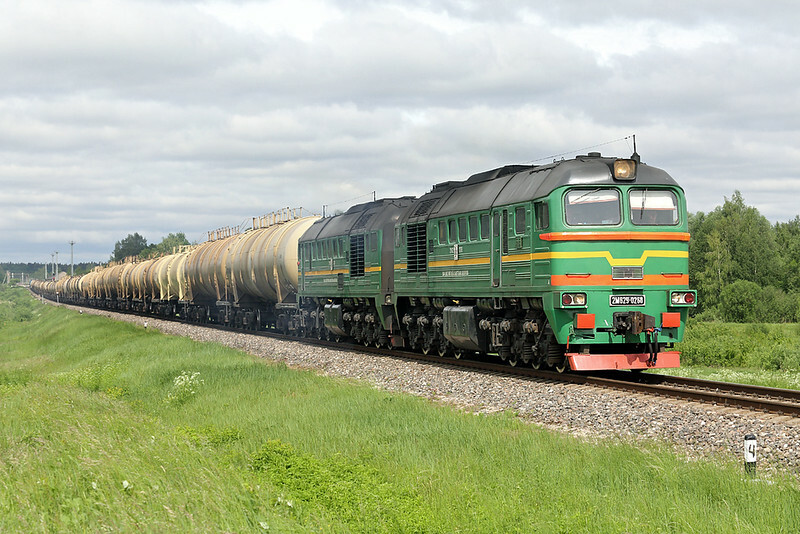 The only passenger trains on this line are the overnight sleepers to Belarus and Russia so it is just freight to be seen during the day, mainly long rakes of huge coal hoppers but also oil for export. Like most lines in this part of the world freight is plentiful with on average at least one or two per hour to be seen. There are loops about every 10km to enable trains to pass; the speed of the trains mean they can follow each other about 10 minutes apart but you are talking at least 20 minutes for one to get from a loop to the next. The speed also means if you know where you are going it is easy to chase them in the car. Mind you dependent on whether or not they have to stop to let another train go the opposite way, even if you don't know where you are going you can still beat them. We spent the rest of the afternoon here at Naujene before heading to our Hotel in Daugavpils. We had been recommended the Hotel Duets as being handy for the railway. In fact it is located in the middle of the yards! Whilst Richard got refreshed Neil and myself were able to make the long 50 metre journey from the front door to get a picture of some of the various engines shunting. 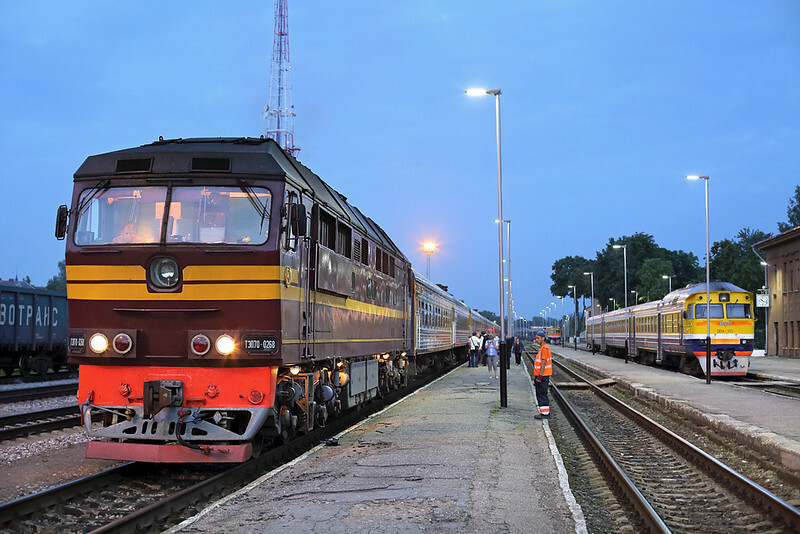 One advantage of going in June was that it was still light when the Sleeper trains arrived at Daugavpils. 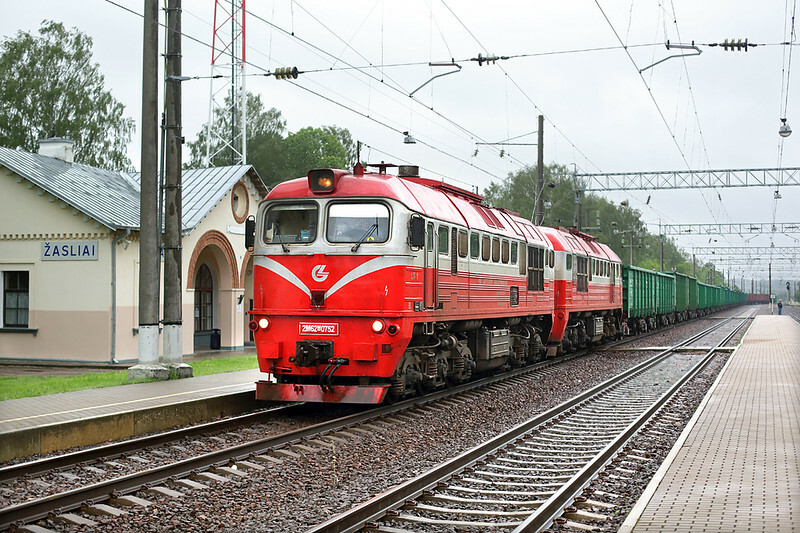 There are two, one from Vilnius and one from Riga which then get reformed into trains to Minsk and St Petersburg. 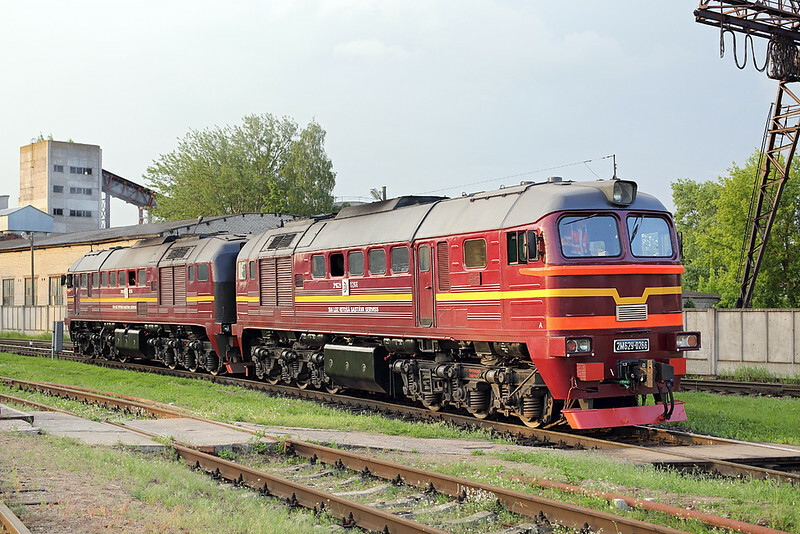 A Lithuanian TEP70 from Vilnius and a Latvian one from Riga are joined by a Belarus example which takes the Minsk portion away, all assisted by a local shunting engine. The Latvian one then heads the St Petersburg portion north to Rezekne. Richard was starting to panic we wern't going to find anywhere for tea by this point, even the local burger joint had shut at 9pm. We were lucky though that the only other restaurant we found, needless to say a Pizza place, was still serving, but only just! Some welcome grub and Latvian beer to finish the day. I put my headphones in to sleep in the hotel to cover up the sound of the woman voice who was constantly issuing instructions over the shunting yard tannoy system. 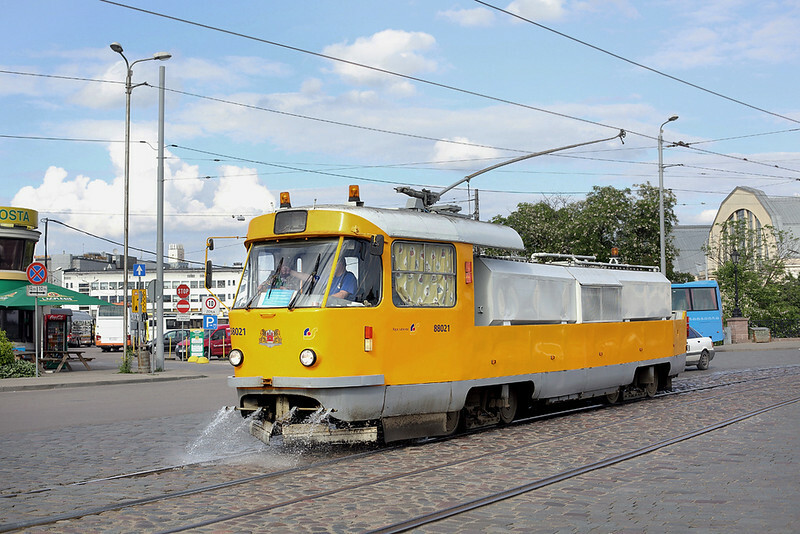 There are three tram systems in Latvia, Riga of course, Liepaja on the coast and Daugavpils. I have no idea what the Liepaja one is like but I'm guessing the Daugavpils one is the most run-down of the three. 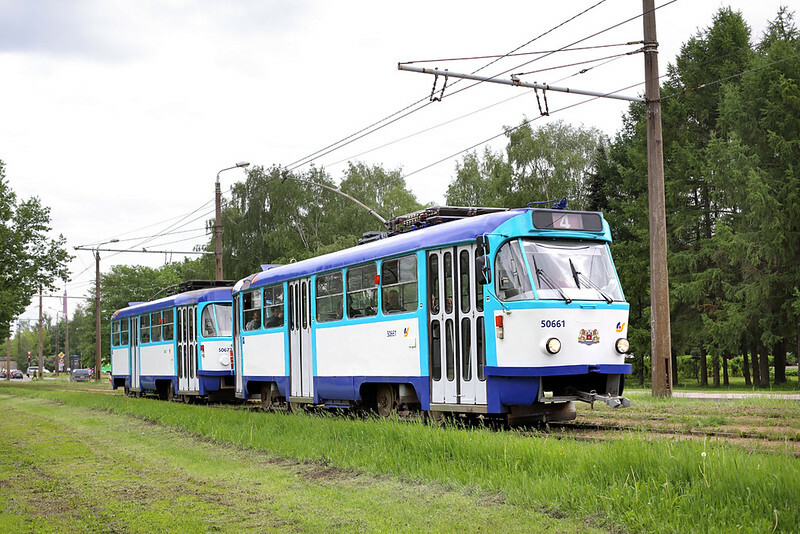 There is modernisation work taking place and I understand new trams should have already been delivered, but haven't, but for now it is still being operated by Latvian built RVR trams and Russian built KTM ones along with several, presumably second-hand, Tatra examples. There are three routes all running on very odd frequencies and the trams are staffed with conductresses in traditional Russian style. All lines run for some length along the main A13 'Novembre iela' east of the railway bridge though only routes 1 and 3 serve the actual City Centre (Line 1 operates every 9 or 12 minutes and Line 3 every 25 minutes). Line 2 (roughly every 28 minutes, I told you the frequencies were bizarre) turns off the main road before it reaches the railway and runs down Ventspils iela, pictured above. We were lucky, after a few phone calls by the cleaner, to get a guided tour of the tram depot by her. Well done to Richard for somehow explaining what we wanted! All my pictures of this interesting tramway can be found HERE. Following this we headed east again to have the remainder of the morning on the Belarus line. 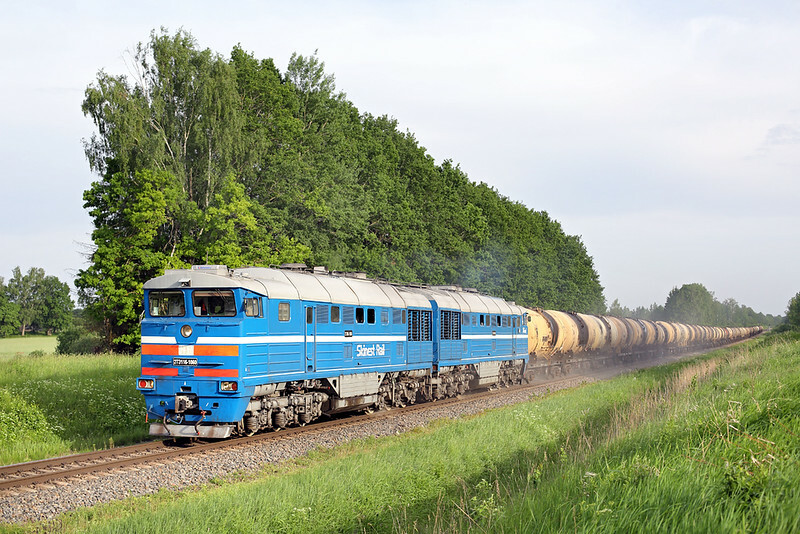 As we were getting provisions from a garage on the outskirts of Daugavpils we could hear a train behind the houses so chased it to Naujene for a shot. We then continued east into the 'Border Area' (so the road sign worryingly said) and beat it by about 20 minutes to the next location, a crossing on the road to Ludvikova. 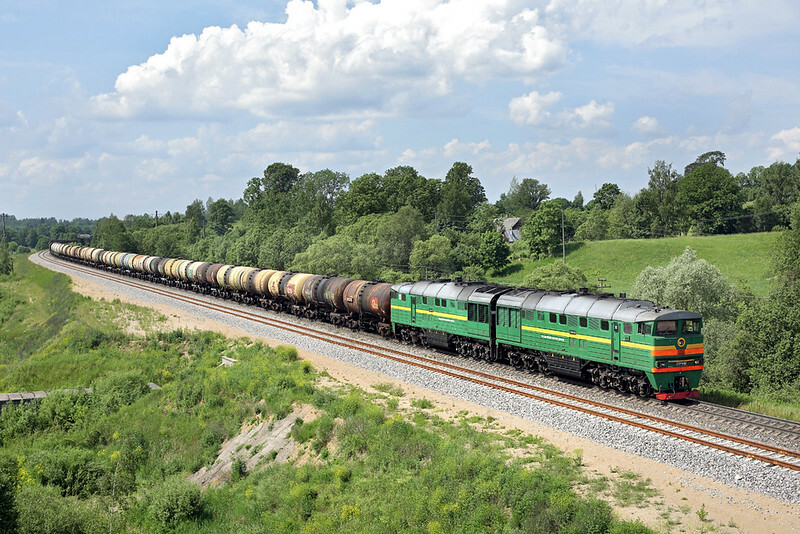 We got a freindly wave off the driver as it went past and following it was another five freight trains at intervals of about every 10 minutes, all headed by Belarussian 2TE10s. 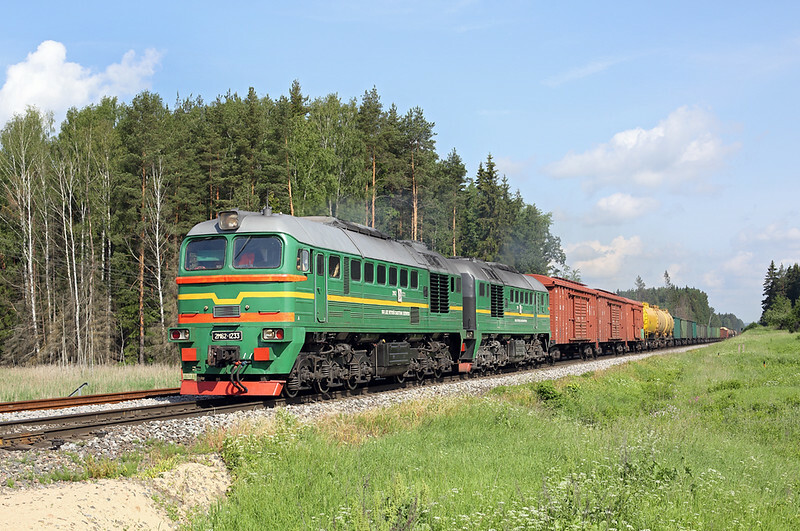 The weather had set fair now finally but with sun moving round we waited for one westbound working before heading back towards and round Daugavpils and up the A8 towards Jekabpils. Glimpsing a train as we crossed a bridge over the main line we diverted off into the woods to a small crossing near Ruzi for a shot of what turned out to be a rare LDV 2TE11 in a blue livery. the only other ones in this kind of livery we saw were operated by open access operator Skinest Rail. One of these we saw at our next stop, Upenieki, to the south of Jekabpils where we spent the rest of the afternoon. 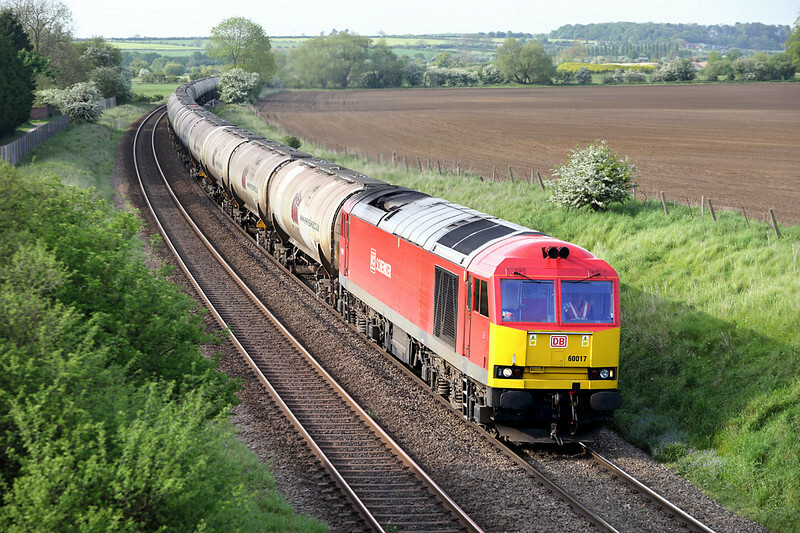 The line wasn't very busy but we did see five freight trains plus a couple of passenger DMUs in our few hours there. This is the Skinest Rail picture, the engine named after me. We arrived in Jakobpils just in time to see the Riga to St Petersburg and Minsk sleeper train call off at the towns station, actually situated the opposite side of the river in the neighbouring town of Krustpils. This station is also being totally redeveloped in conjunction with more doubling work, this time of the line north from Krustpils towards Riga. The train stopped for less than a minute so after an initial shot of it arriving I only just got to the front in time to catch the results of the eruption of thick black smoke eminating from the engine as the driver opened it up. We had struggled to find anywhere in Daugavpils the previous night to have our tea, Jackobpils was even worse. As far as I can make out there are only three places to get hot food in the town. There is the obligatory Pizza Restaurant (which had already closed at 9pm), a kebab shop/chinese takeaway and a burger place on the edge of Krustpils which was the Baltic equivelent of McDonalds or Burger King called Hesburger. It actually turns out this is a Finnish company but we only discovered this (where the restaurant was, not where its from) the next day so the only thing we could do for tea was go to the supermarket and get some beer, bread, cheese and salami. The hotel we were staying in (probably the only hotel in Jekabpils) was the Hotel Daugavkrasti a rather bizarre communist era building located on the river bank that's certainly seen better days. Having said that apart from the lack of facilities there or in the town it was a decent place to stay, certainly interesting. The following day Neil was meant to be getting an early train to Riga for his flight home. There are two trains in a morning from Krustpils at 7am and 9am (the next train isn't until 1800), he was aiming for the second of those, however it turns out that randomly it doesn't run on a Thursday. 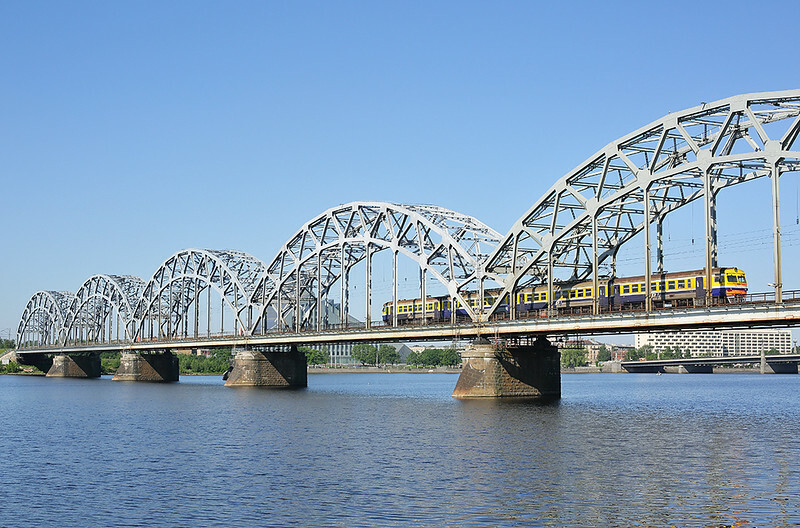 I think it might be half-day in Riga on a Thurday, this is the only explanation I can think of, so he ended up having the morning with us photographing at nearby Mezdarzi on the line to Jelgava. We had to drive 50km to Aizkraukle so Neil could catch a train, that being the limit of the electrification from Riga and so having a reasonable EMU service (or bus replacement for part of the way, again probably due to the doubling work). After Jekabpils the next point you can cross the River Daugava is beyond Aizkraukle so taking advantage of being that way we headed across to meet up again with the Jelgava cross-country line which runs through some lovely wooded countryside for a long distance south of the river. Taurkalne was the nearest point, one of the many passing places on that single track route. There are level crossings at either end, the one at the eastern side being best for the sun at this time of day, not that there was too much of that to be seen by this point. 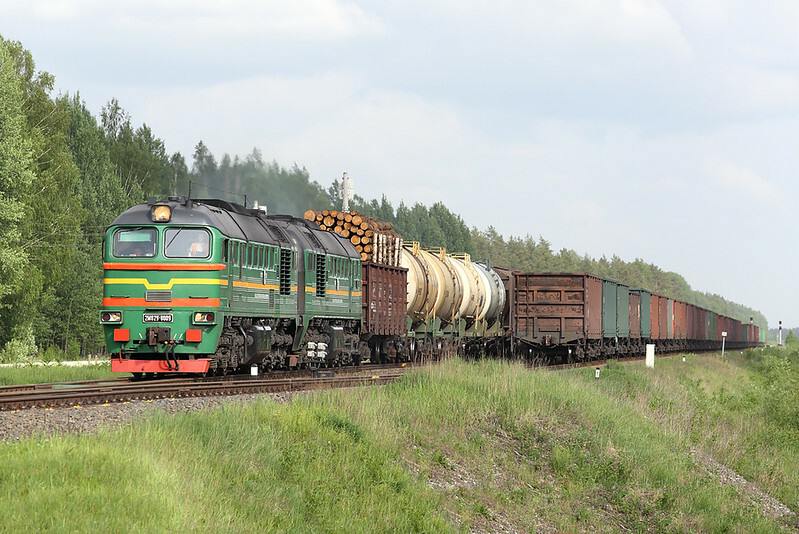 Once again there was a fairly steady stream of freights passing every 30 minutes or so and after a few pictures here we headed towards the next loop deep in a pine forest at Menta. Besides the forestry vehicle we saw as we turned up we didn't see another road vehicle for the next couple of hours: it was a lovely spot to wait marred only be the inconsiderately dumped rake of loaded coal hoppers on the nearest of the three tracks which blocked the shot of trains somewhat. We finished off the day with another shot of the sleepers back at Krustpils before a visit to the Hesburger, and to a supermarket for a new pair of trousers as my jeans had mysteriuosly got ripped somewhere. Plus of course the important bottles of Latvian beer so we could chill out with them back at the hotel. By the way the jeans only cost 11 Euros and seem far better made than the rubbish you get in this country from Primark for about the same price. The one big advantage of having to buy these was I got to spend the end of the week with a fresh pair of trousers on! Our final full day was to be more of the same, except without ripped jeans, working our way back to Riga for another stay in the Hotel Best. We weren't sure how busy the mainline from Krustpils to Riga would be, especially with the cancellation of the passenger train the day before. We hedged our bets and went to Spungeni a few miles outside Krustpils where a small lane crosses both the line to Riga and the one to Jelgava seperated by only a few hundred yards. This time it turned out there was far more moving on the mainline. We worked out you could sit in the car watching the signal at the top crossing and if you heard the bottom crossings sirens sound just make it down to the bottom in time to get across the tracks on foot to get a shot. Thank god for slow moving trains! Again the signals going blank when a train was approaching from the opposite direction was helpful to know, although as can be seen from the picture above the second track is in situ and once that open the signals will cease to be of any use for giving you that slight extra warning. Heading along the mainline we took a bit of a short-cut through the town of Plavinas which meant we totally missed out the bridge we were aiming for and so wasted more than 30 minutes driving trying to work out where we had gone wrong. The location was a high bridge near the edge of Plavinas on the main road that skirts the town. The road is very busy but personally I didn't have a problem as there is plenty of room to stand off the road behind the crash-barriers. It's a morning shot of stuff coming from Riga, and late morning onwards for stuff leaving the station. You don't get much warning of trains approaching from the west but again observing the signals proves to be useful. Even when the additional line is commissioned as the station loops start just beyond the bridge the controlling signal will still have to be cleared when a train is due. We wanted to return to Taurkalne on the other line whilst the light would be best for the first crossing which we hadn't covered the day before so when a tank train headed west at Plavinas we chased that to Aizkraukle and got two more shots of it enroute. There is a decent level crossing immediately to the west of the station which would be useful for anyone based in Riga to reach by train. Heading south across the river (which the road crosses underneath a hydro-electric dam) we returned to the Jelgava line in the forests. there was the usual steady flow of freights, not just coal and oil but some more interesting mixed trains too. We ended up at Vecumnieki which was a convenient final location being located at the eastern end of the former stations loops and near a decent road, the P89, back to Riga. The weather had broken by this point with us narrowly missing a passing thunderstorm. Fortunately it was one of those crossings where you could sit next to it in the car and listen for the distant sound of a train or the lights to flash so we didn't get too wet waiting. It was quite late by the time we got back to Riga and after another quick meal in the hotel bar we only had about 90 minutes in Riga itself for some final beers. It seemd much busier too than the previous Saturday but I suspect it was some kind of public holiday that weekend. Richard had an earlier flight than me, in essence I had the best part of the day still to go. We drove briefly to Daugmale depot in the suburbs. Located in the middle of the main Riga yards a handy footbridge crosses over them all giving good views. There is a station next to the footbridge with trains stopping fairly frequently, otherwise if you're worried which one to catch bus route 18 runs every 30 minutes from the City Centre and stops outside Be aware though that there are several railway stations you will pass in the yards, Daugmale is the second. Richard dropped me off in the City Centre by the river and I had 45 minutes sat on the front as the light was good for pictures of the EMUs crossing the substantial bridge over the River Daugava. I'm not sure if much freight passes across here, I'd seen a Skinest Rail operated one the previous week but in the rest of the time I was near enough the line to see anything I didn't see any others. A place I had wanted to visit was the Latvian Railway Museum which is located on the far side of the river by the new National Library (if you look closely the Library is the traingular shaped building beyond the rear of the unit in the picture above). It turned out to be well worth the 3 Euro entry fee (though you could probably get away without paying that) and the 20 minutes it took to get shots of the exhibts outside including an elderly TEP60, an old TEE (I think) double loco, a few shunters, steam engines and this weird beast. 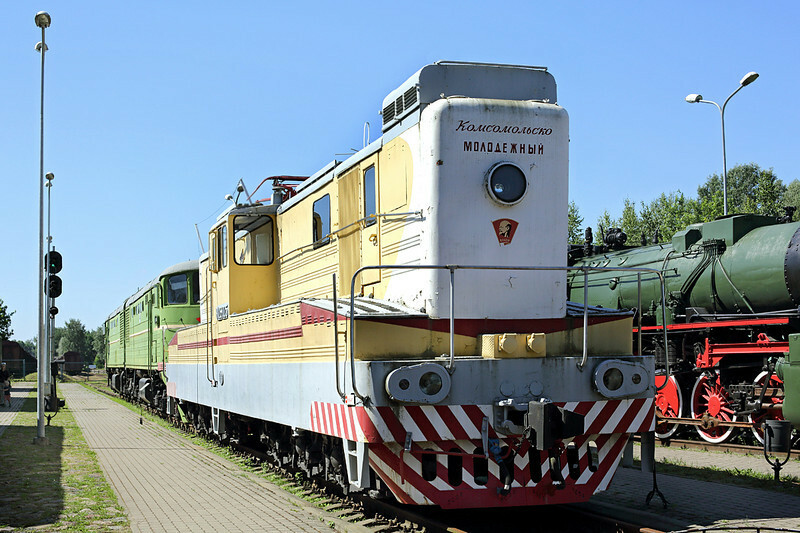 It's a battery/overhead power loco built in the Ukraine initially for use for construction of a dam but in use as a shunting and trip loco in Latvia until as recently as the late 1990s. Apparently it only dates from 1978 so is only as old as a British Class 87! I still had about 3 hours to waste so went for a ride on Riga's antique tram car 1901 which operates at weekends on what is essentially the route 11 from the City to the municipal parks and Zoo called Mezaparks. 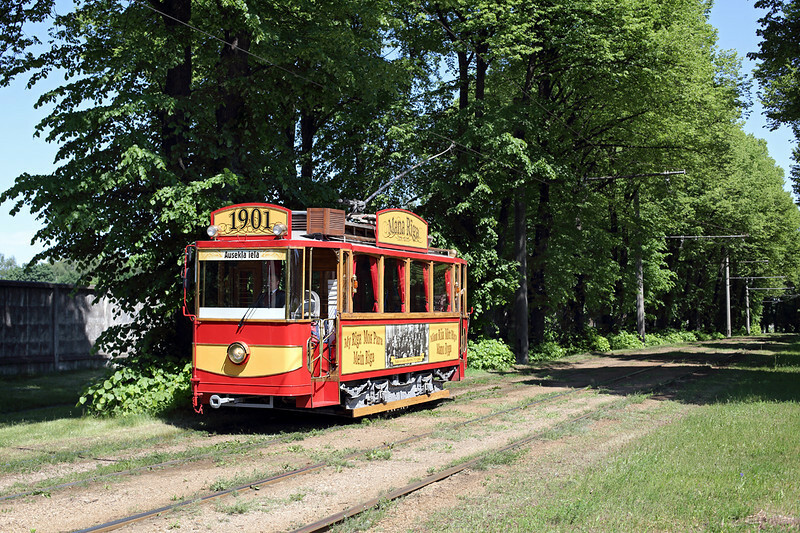 The tram itself only dates from about 1910, the figure 1901 referring to the date the first Riga tramline opened. A single costs the princely sum of 1.50 Euro so I had a ride up to Mezaparks and, as it goes one stop past there, had time to get off and catch a normal tram back a few stops to get a decent picture of it returning. The 11 tram route is very busy, again I am guessing it was a public holiday as the line also goes past the city cemetery and there was a massive queue of people there waiting to buy flowers and go in there to pay their respects to loved ones. Or maybe it wasn't a special day and is just a normal Latvian weekend tradition. And that was pretty much it. Bus to the airport to find one of Ryanairs scams namely the 7 Euro 'Security Charge' only its passengers have to pay in order to get through the baggage scanning bit at Riga Airport. I can't say I remember reading anywhere about that one when I booked my tickets. The only thing I will say is though that on the flight back it was, highly unusally for Ryanair, not completely full with the seats left being the 'large legroom' rows immediately in front of me that they usually try to charge more for. As they are emergency exit rows Aviation rules mean they have to have people sitting in them so I quickly volunteered and had a lovely relaxing flight back with lots of room. Sods law though getting to move as its the first time in all the occasions I've flown anywhere (without the family that is) that I've been allocated a seat next to a young attractive female. She did look a bit miserable though so the legroom was far more important. I hope this blog will help anyone thinking of going to the area to photograph the railways. Again the locations I have mentioned, if you put them in Google Maps, should be obvious as to where they were taken from, Streetview if available should also help you find the spots. It's well worth a visit to these countries, lots of big smokey diesels on fairly frequent freight trains and no hassle from anyone anywhere. Even Riga, known for its stag parties, was a nice place to visit. Thanks for taking the time to read, I'll leave you with a picture of my fellow crazy Estonians. Bye for now!